Tim Wynne-Jones’ “The Goose Girl” is a re-telling of the Grimm Brothers’ tale of the same name, but it is also a discussion of the nature of re-tellings and of the nature of “truth” itself.. His story is told from the perspective of the Prince, who narrates his encounter with the young princess and the chambermaid. As in the Grimm Brothers narrative, the princess and chambermaid switch clothes before the castle and the prince assumes that the chambermaid is the princess he is supposed to marry and that the young princess is a peasant girl, who he finds work for as a goose girl. The prince is deceived by a change of clothing and has to uncover the truth through interacting with both chambermaid and princess to discover the truth behind their presentation of selfhood. They are clothed in fiction. Wynne-Jones narrates a tale of successive fictions. 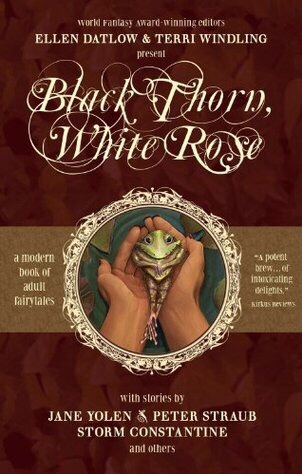 After living the experience of encountering the faux princess and the goose girl, he hears a peasant narrating her version of the tale, and, even though he interrupts her at times to ask her to narrate the truth, she is bound by the nature of fairy tale tellings and imbues her story with symbolism. In the prince’s own narration of his events, he also invokes other fairy tales, illustrating that a fairy tale understanding is not just a feature of peasants, but is something embedded into every aspect of his culture. He plays with the idea of finding out the truth about which woman is a peasant and which a princess by placing a pea under a mattress and discovering which one of the two is unable to sleep, invoking the princess and the pea narrative in order to discover his own truths and the truths that he has been denying – namely, that he knows that his lover is actually the chambermaid rather than the princess and that the goose girl is the true princess. He resorts to fairy tale understandings in order to interpret his own unconscious, illustrating the symbolic power and value of fairy tales to get at hidden truths. Despite the prince’s correcting of the “facts” of the tale told to him by the old woman conveying folk tales, through his entire narrative, he resisted these facts, ignored truths and relegated them to the subconscious. Tim Wynne-Jones’ “The Goose Girl” is a tale of inconvenient truths, the power of stories, and the nature of fairy tales. He plays with the idea that there are truths in stories and that there are stories in the truths we are told. He reveals that there is often torture involved in uncovering undesireable truths.